In order to comply with GDPR regulations we will only retain your name and details for as long as is necessary for us to deal with your enquiry. We will NOT pass on your details to anyone other than the person (or people) in our church who are best able to deal with your enquiry. If you are concerned about the way your information is being handled please ask to speak to our Data Protection Trustee. If you are still unhappy you have the right to complain to the Information Commissioners Office. 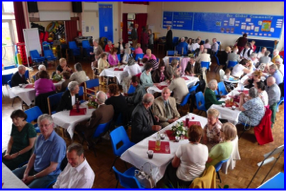 As well as meeting together each Sunday for worship there’s lots more to life at Whitley Lodge Baptist Church. 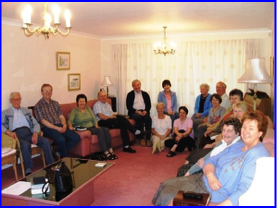 Learning together in Homegroups is important to us, and we presently have two groups meeting on a Wednesday afternoon and a Wednseday evening. .. once a month we host '42' at the Kittiwake pub on Whitley Lodge - 60 minutes to solve all the words problems over a pint of your favourite tipple. Eating together happens often - this time celebrating the 40th Wedding Anniversary of two of our members..